Ultrasonic waves in liquids are interesting because the transmission of sound is closely related to the rate at which the liquid can recover from being compressed, dependent on the microscopic ordering in the liquid. At high enough frequencies the local atomic environment remains frozen on the passage of an acoustic wave, leading to a stiffer response. This phenomenon is known as structural relaxation. Liquid mercury is particularly interesting because it is known to exhibit a huge variation in sound velocity because of structural relaxation: the longitudinal sound velocity increases by 50% at terahertz frequencies (~ 1012 Hz). 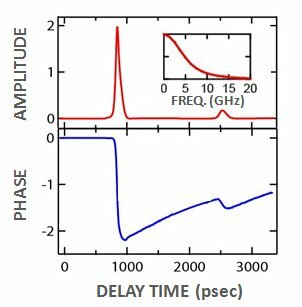 However, the way the sound velocity rises from its low-frequency value (of 1450 ms−1 at <1 GHz) to its high-frequency value is completely unknown. Diagram of the experiment performed. The liquid mercury is a film only 1 μm thick. 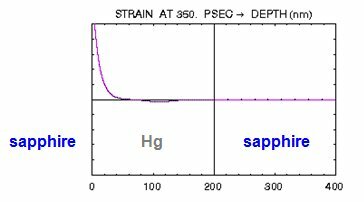 When the strain pulse returns to the point of departure it produces a displacement of the interface and a strain-induced change in the refractive index of the mercury. These changes are detected by another ultrashort light pulse. Results for the first and second echoes. The inset shows the frequency spectrum of the ultrasonic amplitude of the first echo. By comparing the shape of the first and second echoes we could find the variation of the sound velocity and ultrasonic attenuation with frequency, and evidence for structural relaxation. 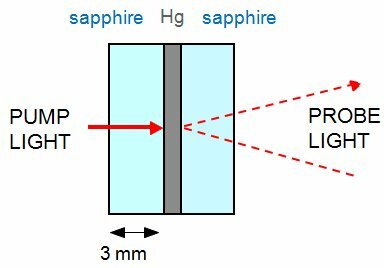 By clamping thinner films of liquids we should be able to extend these measurements up to higher frequencies. 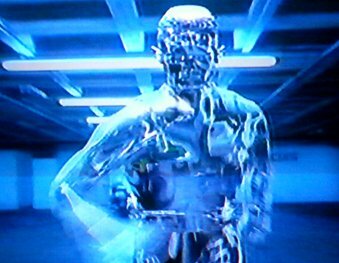 We may also be able in future to better understand the dynamics of liquid metal men such as the one in the movie "Terminator 2".